Turn any wall into an interactive whiteboard and interact from anywhere in the classroom! Control the computer by using the Interactive Pen like a mouse. It allows you to interact with the projection up close or from a distance. DLP interactive projectors make any surface in your classroom interactive, allowing an immersive experience that helps teachers teach and students learn. Project onto existing projector screens or whiteboards or directly onto the wall – anywhere your instructional creativity takes you. The need for any type of special display screen is eliminated. 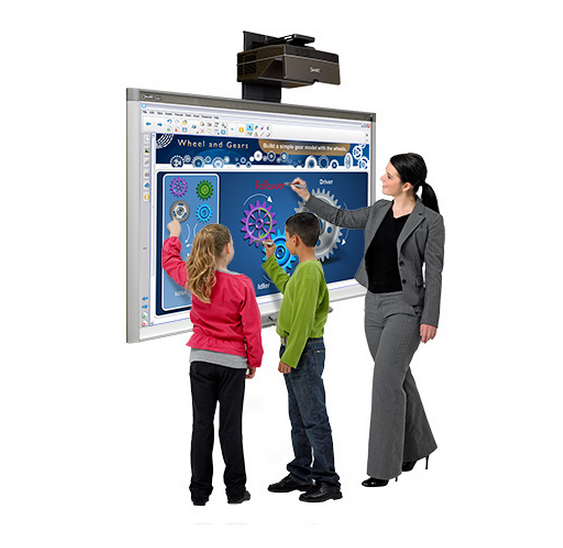 These projectors allow you to interact with your projected lesson plan from practically anywhere in the classroom. By using a special interactive pen, you can draw, point and click by touching the screen directly or from many feet away from the screen. This flexibility also allows teachers to interact with the entire screen no matter how large because the pen interacts from a distance or by touching the screen. Teacher height and reach are no longer barriers to the interactive workspace. Instead, you’ll have incredible flexibility and total control of the classroom. Interactive projectors with DLP technology are the only solutions that allow you to interact on-screen or from a distance. It will give you newfound freedom to interact with everything you project from practically anywhere in the classroom. Also, unlike other interactive projection systems, DLP interactive projectors do not require ANY calibration. Due to a unique pixel level tracking system embedded in the beam, the projector always knows where the interactive pen is pointing without the need for calibration at start up. This can be especially useful for shared projectors on carts – teachers don’t need to worry about having to recalibrate if the cart gets bumped. It will never be an issue and it will never take time away from teaching. Just project, interact and teach! Texas Instruments invented an ingenious integrated technology, coupled with the DLP imaging device to allow the projector to recognize the location of a specially designed interactive pointer pen. Through constant communication with this pen, the system projects your actions. The pen acts as a type of mobile mouse. You can write with it, and interact with any application projected on the screen. This proprietary technology allows a number of projector manufacturers to offer this ingenious feature. Different projector brands may call the feature different names such as “point draw” or “lightboard”. But regardless of the name, the functionality is similar. And while DLP interactive projectors give you new levels of interactivity in the classroom, all of them function as standard, traditional projectors and can switch to interactive mode when needed. See below to learn more about specific models from projector manufacturers that feature interactive projection and ask your projector representative for more information about the advantages of DLP technology from Texas Instruments.